New Feature…Audible Book of the Week! I have mentioned often over the past few years that I like to run while listening to audio books. It is not that I dislike music (I like music very much) but when it comes to training runs, I like the steadiness that the monotone sound that an audio book brings. 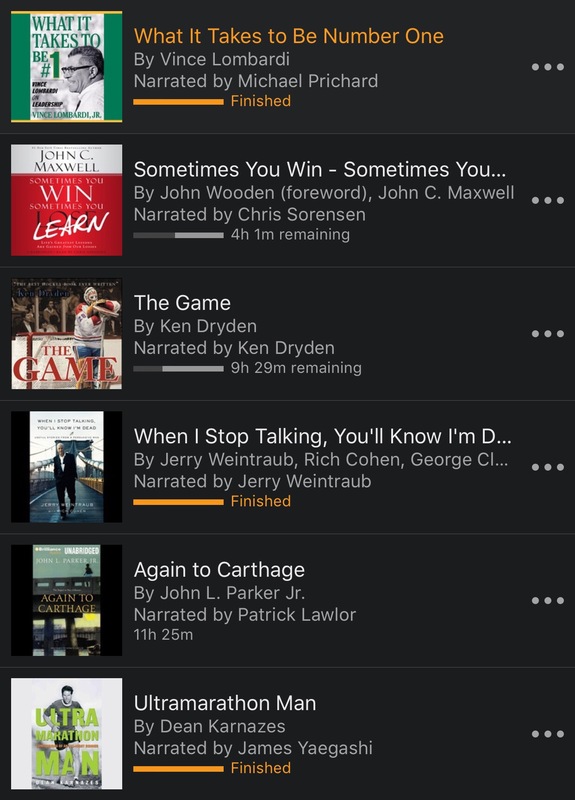 I listen to all types of these books (running, motivation, leadership, sports, etc) and I realized this morning, that it has been a very long time since I posted a note on what I am listening to currently. So here we go… let’s talk audio books! Since this is my first post about any audio book in ages, let’s take a quick peak at the most recent books I have listened to (and a sneak peak of what will be posted and reviews in the upcoming weeks)! As you can see from the list, while running is on the list (UltraMarathon Man maybe my favorite so far though Born to Run is still at the top), it is not the only topic covered. 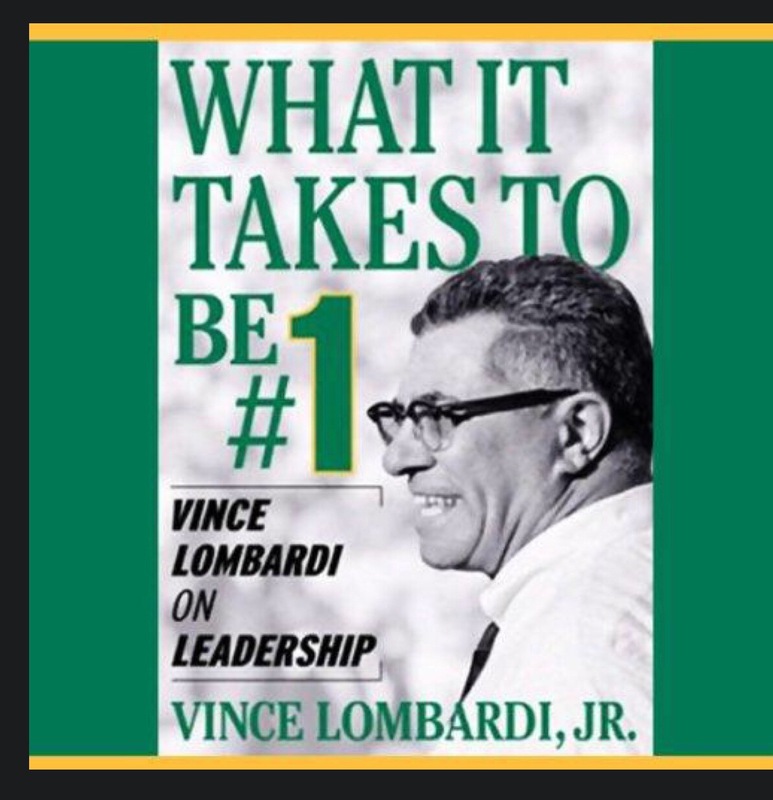 Today I will focus on the book at the Top that is not a running book – “What it Takes to be Number one.” It is a book that is written by the legendary football coaches son (Vince Lombardi Jr) and one that I have read before (and just recently decided to review via the audio medium). Leadership continues to be one of the most written-about and most trained-for qualities in business today. And no figure so fully embodies the leadership qualities managers hope to cultivate in their professional and personal lives as the late Vince Lombardi, the greatest NFL coach of all time.The exalted place Lombardi holds in American culture has never been clearer than it is today, as evidenced by the enormous success of the 1999 best seller, When Pride Still Mattered, as well as the vast popularity of the coach’s son, Vince Lombardi, Jr., America’s most sought-after motivational speaker.In What It Takes to Be Number One, Vince Lombardi, Jr. explores his father’s leadership philosophy, and Leadership continues to be one of the most written-about and most trained-for qualities in business today. And no figure so fully embodies the leadership qualities managers hope to cultivate in their professional and personal lives as the late Vince Lombardi, the greatest NFL coach of all time.The exalted place Lombardi holds in American culture has never been clearer than it is today, as evidenced by the enormous success of the 1999 best seller, When Pride Still Mattered, as well as the vast popularity of the coach’s son, Vince Lombardi, Jr., America’s most sought-after motivational speaker.In What It Takes to Be Number One, Vince Lombardi, Jr. explores his father’s leadership philosophy, and extracts powerful lessons about what it takes to be an effective leader. Taking as his jumping-off point his father’s legendary 1970 speech on the supreme importance of self-knowledge, character, and integrity, Lombardi, Jr. examines each of those qualities and offers guidelines on cultivating and applying them at work and in your personal life.Throughout, What It Takes to Be Number One is enlivened by personal anecdotes and quotes about and by his father, as well as quotes from other great leaders providing further wisdom and inspiration. The first line of this quote sums up Lombardi well. The best version of Lombardi was the person who gave his all to the job, put his players in the best position to succeed and in between, was a mentor and father like figure. People respected his “no bs” demenor and that is a part of what made him successful. In looking at my Kindle Library (yes, I read books from time to time), I also have read three other books about Vince. 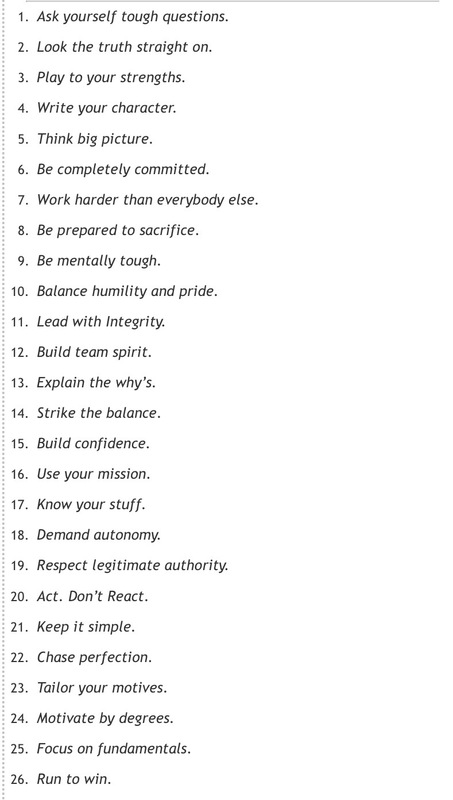 One is the 26 lessons from Vince Lombardi and these lessons are all over this book (I suspect one was a repost of the other). They are as follows (as originally posted in success magazine). My two favorite rules are “think big picture” and “build confidence.” Why? Well, when one thinks “big picture,” they are trying to grow piece by piece sacrificing successes in the short term for consistent success over the long haul. Sure, one can go for a PR each time running but the chance of injury rises. Yes, perhaps the runner gets a PR by running many levels faster than their body can handle, but that might be the last “PR” that such a runner sees. For the one thinking long term, on the other hand, the LT runner builds up to the point that getting the PR is not such a stretch and massive beating on the body. They push harder but in the end, they are walking off the route, ready for the next race – and more opportunities for more PR’s! With “building confidence,” let’s review our two runners again. The first runner, going for broke, might not be prepared for the race and all the surprises that come with races (terrain, weather, etc). The runner is throwing caution to the wind and “going for it!” The second runner, who again is preparing the body for consistent PR’s, plans for the unexpected in his/her training and when surprise happens, the preparation kicks in and the runner can adapt. This preparation was a hallmark trait of Lombardi and when he lead with a confident look and prepared his players well, confidence among the players rose. He showed them that he believed in them and in turn, they began to believe in themselves. Preparation for a runner leads one to be more confident that the obstacles are easily bearable and with long term prep, the PRs become commonplace. My view of this book is split. I very much subscribe to the ideal’s and lessons of Vince Lombardi. On the other hand, I cannot stand his son narrating this book. “My dad” is mentioned too often for my liking. Also, the son’s opinion does not matter to me much…yet he does add his own thoughts. In the end, my grade for Lombardi would be ⭐️⭐️⭐️⭐️⭐️ but for the books audio or presentation would only get a ⭐️⭐️ (both out of 5). From a running a listening standpoint, the lack of any excitement in this book kind of makes this book great from a knowledge standpoint but that is about it.